I find it interesting that over the last few months there are a couple of boxes of fillo dough and puff pastry in my freezer. I’m almost certain I had a couple of ideas bouncing around in my head during those purchases, but it was not until team members from D’Vash Organics contacted me once again to partner with them in creating yet another great recipe using their amazing D’Vash Date Nectar. That’s when I knew exactly what I was going to make. A traditional baklava, in some ways, but using D’Vash date nectar in replace of honey. The result was mind blowing to say the least. Start by making your sweet sauce that will be used after the baklava has baked. You will want to do this ahead so that it has time to cool. Add 3/4 cup of sugar, water, lemon juice, and D’Vash date nectar to a small pot. Bring to a boil on medium-high heat, then once boiling reduce the heat and cook for about 5 more minutes. Stir along the way. After 5 minutes, remove from the heat and let it cool. Now the backbreaking work. Just kidding. This is the only time consuming part, and if you are having your kids help, this can take a bit of patience as unlayering each piece of fragile fillo can be a bit nerve wracking. Just make sure your fillo dough is completely thawed. I set mine out the day before and place it in the refrigerator overnight for a day or two to ensure it is completely thawed. Get a baking sheet out, or if your are super detailed get a baking dish out that will fit your sheet of fillo dough. I go with my baking sheet and make sure that when I layer each fillo that it matches up with the previous fillo dough. Make the sugar and nut mixture. To a food processor, or use a knife if you desire, pulse the nuts into a fine chop. Add the nuts to a bowl along with the remaining 1/4 cup of sugar and cinnamon and give that a good mix. Get your bowl of melted butter ready along with a pastry brush. Unroll a roll of fillo and get ready to baklava! Place 10 fillo sheets onto the baking sheet one at a time, and brush each sheet with butter once it’s in the pan before adding the next sheet of fillo. After the 10th sheet, spread about 1/5 of nut mixture over the fillo dough. Do the same process, but this time layer only 5 sheets, buttering each sheet, then on the 5th sheet, top with the nut and sugar mixture. Do this about 4 more times with the 5 sheet layer process, then on the final top, go back to the 10 stack of fillo, ensuring that all nut mixture is used up before layering the top 10 sheets of fillo. Butter the top of the 10th sheet, then gently push down and form the baklava. Now let’s cut the baklava. Cut the fillo into about 2 inch strips, lengthwise, then make diagonal cuts to make somewhat of a diamond shape. If you want to keep things simple, just cut into rectangles, it’s up to you. Place the baking sheet into the oven and cook for about 1 hour, up to 1 hour and 15 minutes. 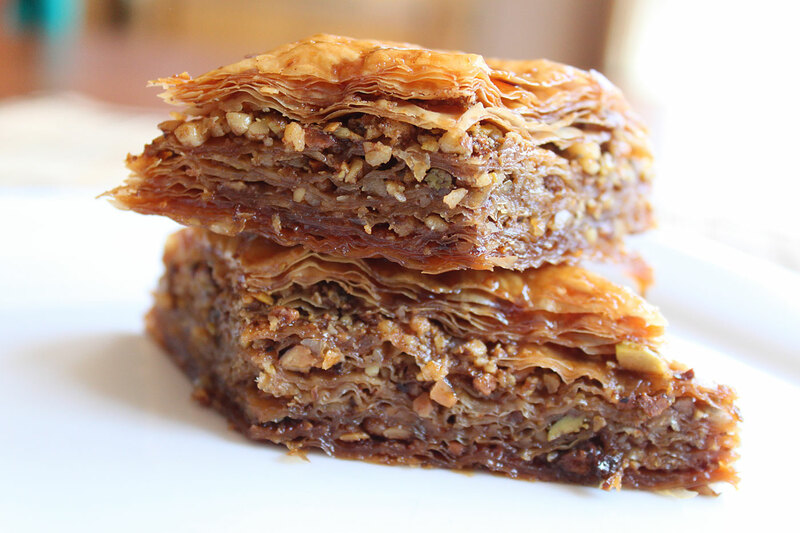 Once the baklava is a great golden brown, remove from the oven, and immediately ladle over the cooled syrup you made earlier, ensuring that you get into all of those crevices. Now the hard part… waiting. The goal is to not only let the baklava cool, but you want that syrup to penetrate all of that great fillo that you took your time stacking. After about 4 hours, go ahead and try the baklava, but trust me the longer you wait, the better it gets. Kids approved, neighbors and friends approved, and chef approved. If you are looking for a great treat that will be sure to please everyone (with the exception of those with nut allergies), then give this baklava a try. The replacement of D’Vash really made this baklava stand out. It had this subtle tartness that really made this delicious baklava pop. If you are wanting to try D’Vash Organics Date Nectar (and I highly recommend it), then head over to their store and pick some up. My lucky readers can use the coupon code DVASHSIMPLECOMFORTFOOD upon check out! Hope you enjoy D’Vash as much as we do!